Let’s get one thing established before we go too far: the concept of “perfect” varies from person to person. So in this article what we’re aiming for as perfect is this: a steak that has a decent charred crust and is right around medium rare. Have a read through and follow the directions and you should be well on your way to attaining this. To start with you need a good cut of meat. A good thick piece of meat is highly recommended. Try and pick something up that is about an inch and a half thick. The other dimensions of the steak are largely irrelevant, though a 12-16 ounce piece of meat is a good weight to begin with. 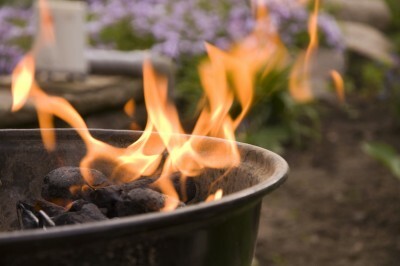 Prepping your coals is best done by getting a good set of half-white briquettes and using them on half the grill, while the other half remains unheated. This is important so you can pull the steaks off the heat if there’s a flare-up, which can burn the outside and leave the center cold. Leaving the lid closed for a couple of minutes after doing this will bring the grill up to the proper heat. Before tossing the steaks on the grill you should apply melted unsalted butter (lightly) either by dipping the meat or brushing it, and then add freshly ground salt (a lot) to help build a great crispy crust. If you’re partial to pepper you should also grind some up and spread it across the steaks at this point, though it’s not a critical part of the process. Right before placing them on the heat you can compress the sides of the steaks in order to get as much height out of the meat as possible. When you place the steaks on the grill watch for flare-ups from the butter and fat. If you get one at any point you should shift the steaks off the heat without flipping them. Now, there are a few different theories as to how often flipping should take place. Some people subscribe to the single flip method of cooking. Others insist on two. But what you should aim for here is to flip the steaks three times. Go ahead and leave the steaks on for about three to three and a half minutes each time (taking care to avoid burning through those flare-ups by sliding the steaks off the heat until they pass) for a total of six and a half to seven minutes per side. Now, this should give you steaks that are medium rare. The absolute best way to test this it is to check the center with a meat thermometer. It should be right around 120 degrees. A little bit less should also prove sufficient, and a little bit more just means you’re going to see a medium rarity. Remember to let your steaks sit for between 3.5-5 minutes before cutting into them in order to let them finish cooking (through residual heat) and to let the juices properly infuse the meat. They’ll just run all over the place if you cut too soon! Serve the steaks up with sides as you prefer. I’m partial to corn on the cob or a baked potato, and a fresh garden salad. Finally, when your steaks are prepared this way they should require no additional condiments except perhaps pepper if you left it off originally. And even if you’re one of those steak sauce adherents, you owe it to yourself to try the meat unadorned before you cover up its natural flavors. Flavors which have been enhanced with the butter coating and generous amounts of salt. The trick to keeping camping gear down to a minimum for camping cookouts is to use food items you normally bring along. Some serve double duty as ingredients for BBQ sauces. Mustard, ketchup and sweet pickle relish, condensed canned soup, onions, maple or pancake syrup, sugar, orange juice and other fruit juices, iced tea, cola soda, milk and brewed coffee are usual fare brought to camping cookouts. These make BBQ sauces extra flavourful. Blend condensed soup with four remaining ingredients until thick and smooth. This is also good marinade. Marinate an hour before grilling to infuse meats with deeper flavor for chicken or ribs or a condiment on grilled hamburgers. Blend condensed soup with milk, coffee and syrup. Add onion and mustard. Brush chicken, beef or pork with BBQ sauce before placing on BBQ grill. Turn meats for even grilling. Dehydrated ice tea mix adds piquant flavour to meats when added to BBQ sauce and Marinades. Pre-mixed ice tea is a good base for BBQ sauce and marinade recipes. Blend dehydrated ice tea mix with orange or fruit punch flavor juice. Mixture will be slightly thick. Add in sweet pickle relish. Blend separately sugar and mustard. Add to iced tea/juice mixture. Thicken with ketchup. Marinade: Instead of 1/2 packet of dehydrated iced tea mix, blend pre-mixed iced tea with juice, sugar and mustard. Omit sweet pickle relish. Marinate one hour. Blend tea, milk and sugar. Blend crumbs. Add chicken, seafood or ribs. Marinate one hour. Guest blogger: This is a guest post from Lauren Brown; blogger for Al Fresco Holidays, specialists in self-catering in France.